Waiting on Wednesday is a weekly meme hosted by Jill at Breaking The Spine. It showcases our most anticipated books. 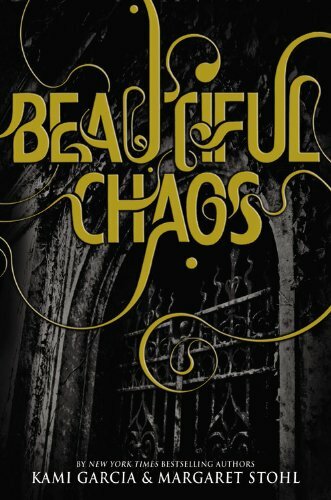 This week, my pick is Beautiful Chaos by Kami Garcia and Margaret Stohl. Summary: "Ethan Wate thought he was getting used to the strange, impossible events happening in Gatlin, his small Southern town. But now that Ethan and Lena have returned home, strange and impossible have taken on new meanings. Swarms of locusts, record-breaking heat, and devastating storms ravage Gatlin as Ethan and Lena struggle to understand the impact of Lena's Claiming. Even Lena's family of powerful Supernaturals is affected - and their abilities begin to dangerously misfire. As time passes, one question becomes clear: What - or who - will need to be sacrificed to save Gatlin? Why I Can't Wait:First off, I have to tell you that I absolutely love this series. The world building, the details, the characters, the drama...I love it all. Plus, with a main character named Lena, you know it has to be good. I could gush about how much I love Ethan and Link and Macon and bacon, but we'll save that for a later date. Next, I gotta say that the summary for Beautiful Chaos TERRIFIES me. There's not going to be a happy ending this time? The other endings were considered happy? Ack. Nervous? Yes. Scared? Uh huh. Excited? OMGosh, YOU KNOW IT! I can't even read the summary yet since I haven't read Beautiful Darkness yet. I will though, no worries my friends are bringing it for me in two weeks. @Cynthia- Right? Do we need tissues? I hope not! I haven't read Beautiful Darkness yet! *tears* I'm in trouble!!! I need to read this series soon!